Mike Nasser was the single most influential Martian Manhunter artist of the 1970s, and one of the most important in the character's history. 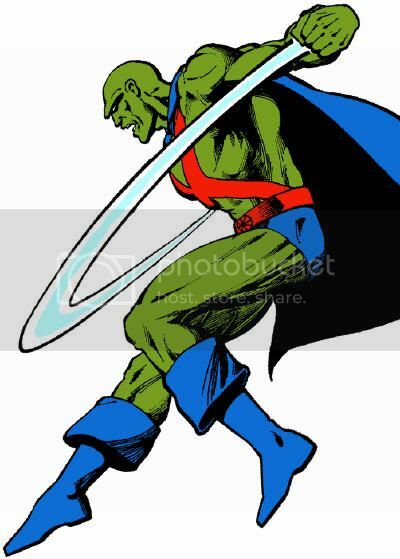 Nasser brought back J'onn J'onzz's original alien look, designed the "Manhunter from Mars" logo, and helped popularize the obscure hero through a late decade serial in Adventure Comics. The rechristened Michael Netzer has also been a friend and benefactor to this Martian Manhunter blog, gifting it with free artwork (including our distinctive banner.) In his honor, we present a comprehensive link list of the blog's output related to his work, accompanied by art remastered by Tom Hartley. 2008 "Take Me... But Don't Kill J'Onn" (Art for and discussion related to Michael Netzer's internet crusade to save Martian Manhunter from murder in Final Crisis. Adventure Comics #449: "Mission: Catch A Killer"
Adventure Comics #450: "Return To Destiny"
Adventure Comics #451: "The Suspects"
World's Finest Comics #245: "Today Mars, Tomorrow... The Universe"
"What Would Michael Netzer Do?" The Atomic Bomb (A consideration of the pin-ups Netzer created for several blogs during is campaign, especially Atom: The Tiny Titan's. Super Powers/Super Friends (A consideration of the pin-ups Netzer created for several blogs during is campaign, especially The Aquaman Shrine's. it took me a while to get through all those links but it was well worth it. The Osprey's Time Is Now!